Tears of the Moosechaser is not my normal cup of tea. It feels more like a swig of Absinthe. 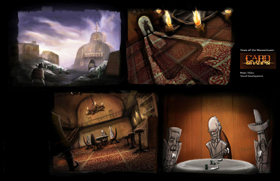 It can transport you into turn of the century hallucinations. The funny thing is that parts of Songs for a Sinister Woman would seriously creep me out if I were to listen to them in the dark but other songs feel as comfortable as the warm embrace of a knitted afghan my grandmother made me. "...Their sound is indeed predicated on fusion, since it is an amalgamation of different genres and subgenres, as well as styles and techniques. Each song has its own mood, just as each song evokes its own imagery, like old Depression era photographs of dust bowl shack towns and filthy-faced folk, piles of animal bones in the dirt, Johnson family vagabonds hopping the unlocked freights out of small desert towns for large metropolises, burlesque houses and old-time harlots lounging on dusty sofas, drunkards stumbling down dark alleyways in the post-midnight hours, love stories, tragedies, rustic scenery, the seemingly endless stretches of highway and blurry miles to the weary traveler, and so on in that way. Also, it is highly texturized music, at once both savage and refined, mad and sane, bitter and sweet, ugly and beautiful, dark and light, rural and urban, and old-timey and modern, among a good many other contraries. But above all it is a fusion of wood and rusty metal. Wood and rusty metal." "I suppose if Tom Waits wasn't born in California but rather underneath a moonshine still in Kentucky then you'd have Tears Of The Moosechaser ... "A Lonesome Fog" screeches and scrapes with a mix of country, avant-garde, and bluegrass to create a sound I can't say I've ever heard before. It's exciting, creepy, inquisitive and original. All the while wrapping itself around a Western filled with spurs, dust, tumble weed and whiskey." "Hey, Everyone! 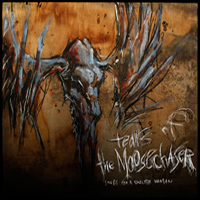 Go listen to Tears of the Moosechaser. Then like them on Facebook. Then get their record. Then like them in real life. Then listen to the record over and over. Then wander into the desert blind drunk on backyard-distilled hooch with rattlesnakes in both hands until you find a place to found a town whose chief exports are woven yucca-leaf baskets and highwaymen. Yeah, it's that good." "Bravo, What a great contribution to dark roots, gothic Americana, insurgent country, and lo-fi mechanical noise over a backdrop of organic instrumentation! You can call me an Instant fan." "The name alone is enough to spark inquiry, curiosity, and possibly a riot!" On a Mac control click - save link as. on a PC you are on your own. Moosechaser is a bustle of activity behind the scenes. A new album is, indeed, being woven together with the sweat of railroad tracks, wolves teeth, smoke, native feathers and potions of some mountebank. Stay tuned to the media outlets, particularly the Soundcloud, we may just leak some live versions, rarities and new songs shortly. You can follow us on Twitter @theMoosechaser and on Instagram under the monicker @moosechaser. Tony hates social media but you can find his doings at www.doomcountry.org because he is so very organized. Also, you might check out Mesquite Treason. It is with heavy heart that we release our blind fiddle playing virtuoso Chris Stewart back to the hills and stills of Kentucky, as though Kentucky needed another blind fiddle playing virtuoso more than our posse of Moosechasers. On a brighter note, Max Kutner will be joining us on Guitar and Lauren Baba will be taking over on Violin. with resident DJ CARLOS ROSSI spinning Old Western, Country, Hobo Blues, Gypsy, Folk, Weirdo Garage, SurfPsyche, and general tunes guaranteed to warp your puny little minds!!!! HAHAHAHA! 10PM / $5 JAMESONS / PLENTY OF STREET PARKING. BBQ Festival August 4th from 2pm till 8ish. We finish off the what should be a great day of Free BBQ eating at the Redhanded Artisan Shoppe 2nd Annual BBQ Old Timey Music and Variety Party. There'll be a BBQ (veggie and non-veggie), libations, a ton of other bands, and all around goodness. If you miss this you must be crazy. An' GRIT will be playin' between sets all day long! Don't miss a moment. To quench the cries of the many, KBR finally made a new YouTube video featuring railroads for that old vagabond song - "Budapest". 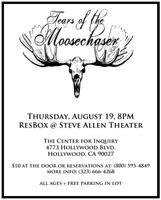 Check it out at "MoosechaserMusic" and feel free to spread it around. We would very much like to thank Alder Bloom at American Pancake for a beautifully written "Sinister" Review. "There is a whole range of Americana roots music and the genre runs the gamut from authentic to hybrid, from light to dark and everything in between. 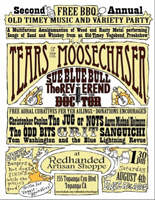 Tears of the Moosechaser, to me, swim in the avante garde / gothic or Southern gothic pool although they certainly can sound traditional as well. On Songs for a Sinister Woman they almost seem to have multiple personalities. "On the Hunt Again", "A Lonesome Fog", "Dog of Sadness" and "The Fool" feel almost more goth than Americana, maybe not musically but in temperament." 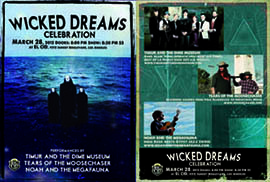 TotM is very excited to be joining Timur and The Dime Museum And Noah and the Megafauna at El Cid for Wicked Dreams Celebration. It promises to be a night of well orchestrated music, eclectic textures and a spectacle of epic proportions. 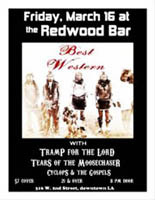 Looks to be a Wild Western Friday night at Redwood Bar! X marks the Spot: 316 West 2nd St., Los Angeles, CA. Leap Day Dedication Concert at the Val Verde Concert Hall. The show will feature Lumber Party, Jamal Moore, John Niekrasz, and Eliot Eidelmans's "Saint Francis Dam Massacre Memorial" with members of Realization Orchestra. 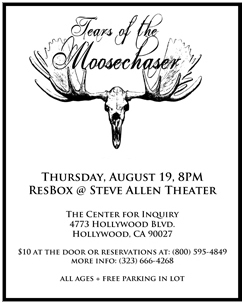 Tears of the Moosechaser will be dedicating this show to our late influence and teacher Arthur Jarvinen. 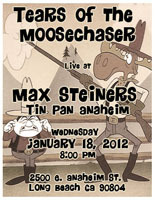 Venturing out seawards to Max Steiners in Long Beach where the show is always free! 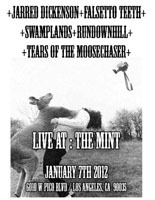 Show at The Mint on January 7th 2012, with Jared Dickenson, Falsetto Teeth, Rundownhill and Swamplands. An All Star Line up currated by Yours Truly. Simon Rouby has assemmbled some footage from our Jawbone Canyon adventure and kindly provided It for the perusal of all at: Simon's Vimeo page. And though the video is missing the mountain hike in which we were almost shot by a wild gang of ATV riders using a quite unfortunate pumpkin for target practice, or the two hours of locating the relocated Dung Mummy camp, It is accompanied by an early version of "We're Really All Crazy". "Songs for a Sinister Woman" is now available in the rock section of Aomeba Records Los Angeles. Why? Because it rocks? Hmmm... There was no serious debate about would this end up in the rock section or the country section? The jazz section wouldn't Take us for the lack of brass though they had Bill Frisell and John Zorn. Classical looked like a good neighborhood with Henry Cowell, Iannis Xenakis, Harry Partch and Anton Webern. Country got the Townes Van Zant, Mearle Haggard, Hank williams, Waylon Jennings, Charlie Daniels, Johnny Western, Johnny Paycheck. Johnny Cash: they put him in all the sections. Merzbow somehow landed in rock with Mr. Bungle/Tomahawk, Sleepytime Gorilla Museum/Faun Fables, Captain Beefheart, Nels Cline, The Angels Of Light, Nick Cave, Tom Waits, Leonard Cohen? Leadbelly? Einstürzende Neubauten? So it seemed Rock was the catch all. Genres... really? 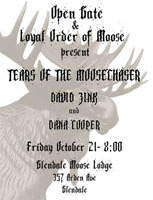 The throngs of fate allowed for A Rare opportunity to see Tears of the Moosechaser in its entirety, full instrumentation, acoustic and all together at once, at a Moose Lodge. Gary Neil captured some footage of the night. It's posted up at our facebook page. We are hoping this can become a more regular occurance. This one is awesome and free. We have been looking forward to this all year and you should scratch this amazing outdoor adventure in to your calender. It's a two night festival so bring a tent, see bands the previous day, hike in the morning and wait for us on Saturday or roll out with us after the Friday Mooselodge Show, Rock faces and bonfires out in the wilderness with some of the best of what the Eclectic avant garde and noise scene of california has to offer. The environment alone is worth the drive the madness out there tips the scale. 28188 Jawbone Canyon Rd Cantil, Ca 92519. Entire Trip is apx. 115 miles from LA Proper. Head down Jawbone Canyon a couple miles until you see marker (construction cone w/ hop-frog written on it, note there will be other cones out there, make sure its the right one) for the dirt road turn off. It will be on your right. In the day turn right after the blue mountains at night look for the projections on the rock. We're about a mile before the road ends. By the way, someone could steal the construction cone (it's happened) so be prepared. P.S. IT'S MUCH EASIER TO FIND IN THE DAY. The blue mountain is really obvious..its saturated in copper deposits. 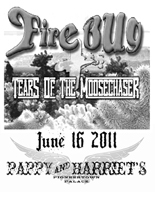 Featuring: Spindrift, Tears of the Moosechaser, RT and the 44s and many more. 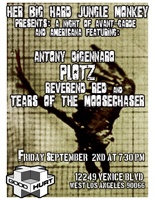 Antony DiGennaro, Plotz!, Tears of the Moosechaser, and Reverend Red at Good Hurt. Firelight - Sunset Junction Hosted by Firebug. Featuring: Tears of the Moosechaser, Drunk on Crutches, Jaybird,The Freedom Ledges, and Firebug. Join us at the backyard stage for a night of friends and acoustic music. BYOB. 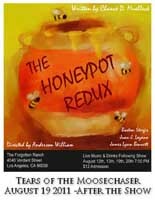 TotM performed the after show for the down home Texas drama, The Honeypot Redux at the fantastically rustic "Forgotten Ranch". With all the wood trees and horses, It was hard to believe we were still in Los Angeles. Well worth a gander if you ever get the chance. Wicked show and venue everybody was really a pleasure many thanks to Sasha Vallely for inviting us out and to all who showed up. Tears of the Moosechaser's song "We're Really all Crazy" was selected as the song of the day at Songshooter.com. Thank you to the Pappy and Harriet's staff for treating us so well. We appreciate that you have not one but two mounted moose heads! Further more, Many thanks to Firebug for having us open up the show and a very special thanks to all who drove out to Pioneertown and the locals who took kindly to takin kindly!! "I suppose if Tom Waits wasn't born in California but rather underneath a moonshine still in Kentucky then you'd have Tears Of The Moosechaser. It's that sporadic, bouncy, wild man vibe that is track three, "A Lonesone Fog" off of Songs For A Sinister Woman. Like a death ring the track chimes in and the tale begins. 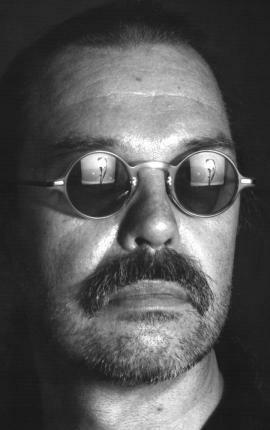 "Sleeping medicine to pass the time, my mind a tangled string of beads rides gondolas through bleeding streams into a leaky sink". Formed in 2008, Songs For A Sinister Woman was released in August of this past year. "A Lonesome Fog" screeches and scrapes with a mix of country, avant-garde, and bluegrass to create a sound I can't say I've ever heard before. It's exciting, creepy, inquisitive and original. All the while wrapping itself around a Western filled with spurs, dust, tumble weed and whiskey. MoosechaserMusic has joined the world of kittens and such on YouTube with a new video of old footage for the gentle classic: "We're Really all Crazy". Once again we would love for you to watch it twelve times a day share it with your friends and have your friends do the same. 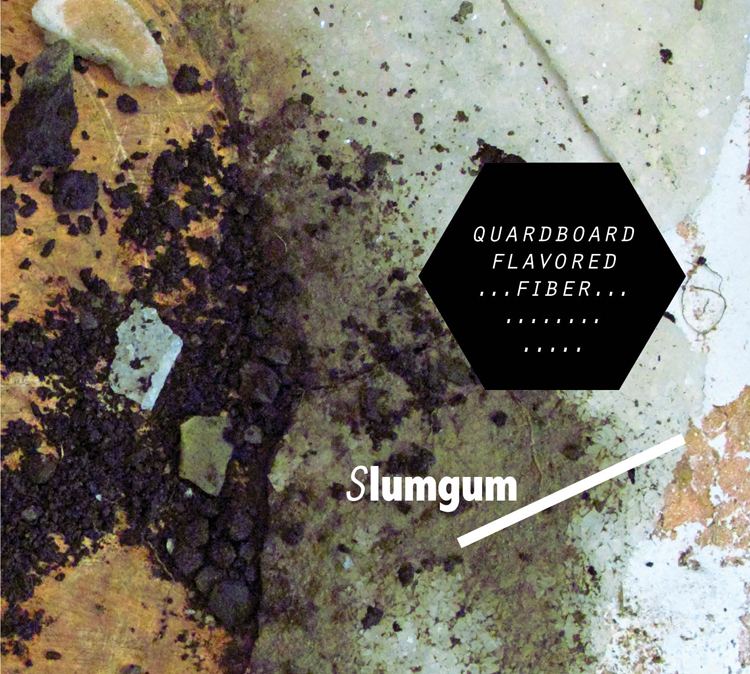 Slumgum has just released "Quardboard Flavored Fiber", a brand new album of experimental jazz landscapes featuring Dashing Dave Tranchina. We highly reccomend going to see Slumgum live in a town near you and buying this masterpeice of avant-garde expression. 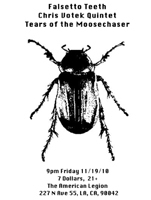 On April 17th at Calarts in ROD, Ulrich Krieger lead the ensemble Sonic Boom performing an epic version of Tears of the Moosechaser's "On the Hunt Again" for more than 11 minutes with extended noise and free passages. Sonic Boom done did us proud, yessir! We are breaking from exclusive Moose news because of our dolefullness at hearing that one of our great inspirations, Sleepytime Gorilla Museum, will be playing their final Los Angeles concert Friday April, 8th at the Troubador. We wish to give them our heartfelt best and send them off in the way of Viking Lords. We will be there in the trenches and suggest that you do the same. 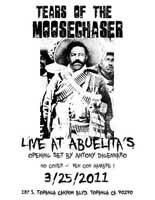 Tears of the Moosechaser at Abuelitas, Comida y tequilla for a little outlaw / south of the border action. Full band minus one. Opening set of new music by Antony, some country standards (which we rarely do) and a performance of Songs for a Sinister Woman in its sinister entirety. This one is going to be one not to miss. Come hungry and thirsty, no cover amigo. For a Night of Los Angeles Country Cowboy morphed Americana Western like you have never experienced before. 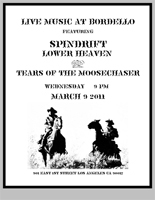 with Psycho-Spaghetti Western group Spindrift alongside Lower Heaven's rhythmic shadows. Going down at Bordello in Downtown L.A.
9:00 pm - $7 at the door. Thanks to James Calson for his write up on "Songs for a Sinister Woman" at Examiner.com. 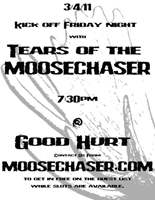 Get sweet medicare from your naughty nurse and Tears of the Moosechaser live at GOOD HURT - 7:30 pm. We've played a few super secret house parties recently, shout outs to Spindrift and Swamplands for their camaraderie. There happens to be some footage on our facebook page. 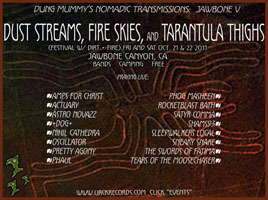 Video posted of Tears of the Moosechaser performing "Lost amongst the Whales" Live at Jawbone Canyon Music Festival IV: Cold Snakes Walk Free from Fire. Special thanks to Donato Lamont for shooting that on his iPhone. To raise awareness about "Songs for a Sinister Woman" we intend to give away a free mp3 copy of "We're Really all Crazy". But for the treat, we need you to do one of two things. 2. Join our Mailing List. (We won't sale your email, just keep you informed of moose movements). Then just kick back and wait for a notification via one of those two routes on November 10th. We will call it... FREE "WE'RE REALLY ALL CRAZY DOWNLOAD" and fill the message with a secret location to retrieve your download. In the meantime tell your friends who you think might be interested. 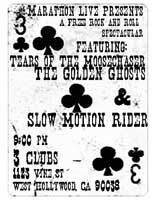 and the American Legion Theater show on November 19th. You have until November 10th to get connected. 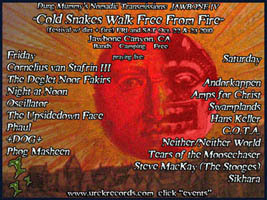 "JAWBONE IV: COLD SNAKES WALK FREE FROM FIRE"
Camping + Music: Friday 22 through Sunday 24, October 2010. In Jawbone Canyon which is about 2-3 hour drive North from Los Angeles. Camp out, roast marshmallows in the fire, listen to Lots of great experimental/world/rock/noise/Americana bands, dance in the smogless night air. Good times. So many great bands, such a sacred place to play music. We felt very at home. We are very excited to have southpaw Gabriel Deutsch (previously of Cameltones fame) joining the live line up as a Banjitarist. "Songs for a Sinister Woman"
After an extended writing and recording process, spanning two continents and more time "Songs for a Sinister Woman" is finally being released into the wild. Self produced, recorded, and funded, the album features David Tranchina on bass (Slumgum), Chris Stewart on violin and vocals (The Mother Funk Yas), James Barry on cello (Hurt Model), Daniel Corral on accordion (The Dime Museum), Ulrich Krieger on bass clarinet (Lou Reed, Text of Light) and Paul Fuller on Banjo (American Primitive). At this time those who have ears are invited you to join us at the Steve Allen Theatre to witness the live birth of TOTM and celebrate the inaugural release of this project. We will be playing the album from start to finish with some extensive sectional improvisations. As part of this special event CDs will be discounted to five dollars for the audience wise enough to witness this very first performance. Many thanks to our friends and extended family for the great turnout at our Launch Party at the Steve Allen Theater last night. Your support has turned the veritable mountain of this undertaking into a joy and we are happy to share the fruits of our labor. We would also like to extend a very special thanks to Scott Knudstrup for joining our lineup for the night and to Hans Fjellestad for having us be part of his monthly series "Resbox" for this special occasion. KBR has edited and posted posted a video for "A Lonesome Fog" on YouTube. It features some hawks eating smaller creatures, a heart beating on its own, trains crashing into each other, spreading fires, and other general anarchy. We think you will enjoy watching it 15 times a day.